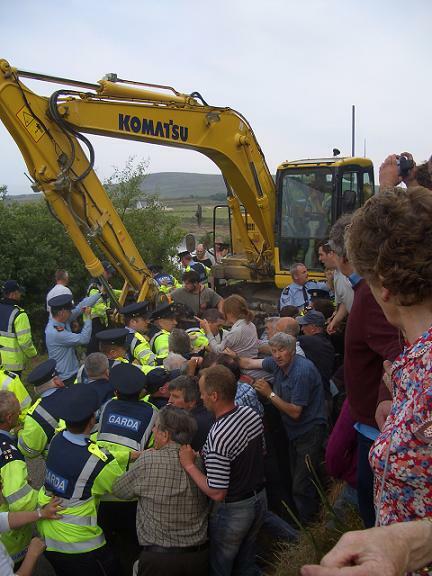 In 2005, when jailing the Rossport 5, President of the High Court Judge Joseph Finnegan stated about a breach of a Shell injuction allowing access to Rossport residents' land, “if ignored then society breaks down. If you insist then I can impose imprisonment and fines, for example hundreds of thousands of euro per day. I have no hesitation in having farms sold. If I have to send every farmer to jail, I will because I have made an order”. In comparison a Shell breach of a court injunction forbidding them from entering land in 2009 is still being processed by the courts.